Copyright 2012 Cambridge University Press. Staying socially engaged is known to improve health and longevity in older people. As the population ages, maintaining levels of social engagement among older people becomes increasingly important. Nevertheless, advancing age brings with it many challenges to social engagement, especially in rural areas. A three-year Australian Research Council Linkage Project sought to improve understandings of age-related triggers to social disengagement in six Tasmanian communities that are representative of rural Australian experience, and thus of wider salience. A collaboration between academics and health and social professionals, the project investigated design solutions for service frameworks that may be useful before ageing individuals become isolated and dependent, and that may support those individuals to actively contribute to and benefit from social life. 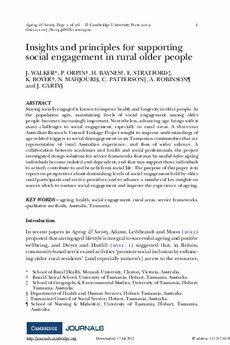 The purpose of this paper is to report on perspectives about diminishing levels of social engagement held by older rural participants and service providers, and to advance a number of key insights on ways in which to nurture social engagement and improve the experience of ageing.